Magazines aren’t quite dead, but they’re in trouble. While places like MagNation in Elizabeth Street are often busy, that might hide the fact that it replaced at least two older specialised magazine retailers (Technical Book Shop and McGills) that were in the CBD previously. At Southland, the newsagency that had been there for decades has recently shut. From what I can gather, there’s now no dedicated newsagent in the centre. Circulation figures show some publications continue to drop. For instance, comparing 2008 figures to 2012, my old favourite Australian Personal Computer fell from 37,156 to 21,612. In that time, Women’s Weekly fell from 530,143	to 465,477 — still a huge number, but undeniably dropping. Gardening Australia fell from 99,058 to 71,955. There is a partial revival however, through better distribution channels (some specialised mags are available via air into newsagents and retailers like MagNation), and interestingly: digital. Zinio is an digital magazine delivery company which seems to have a pretty good range (apparently around 5000 titles in all), including technology, lifestyle, sports, and whatever category things like National Geographic fall into. Their magazines are readable on iPad, Android, Mac OSX and Windows, plus via any web browser with Flash. What’s the pricing like? For some it’s much cheaper than buying paper — for instance the UK magazine Retro Gamer, which I’m quite fond of, via Zinio is A$51.10 for 13 issues (compared to 80 pounds/about A$130 subscribing to paper from the publisher), or you can buy just the latest for A$5.43 (compared to $14.95 for a paper copy in the shops, arriving several months after publication). For others it’s similar to the retail price. Given many people will read a magazine once, then either chuck it out or keep it in the bookshelf for 5 years and then chuck it out, that’s pretty good value. The other thing they have is called a Z-Pass, where for $5 a month you can read any 3 magazines, and swap between titles each month. That particular deal is US-only at the moment, but is apparently spreading to other countries soon. I guess it shows that the important thing is the content, not whether it’s on paper or digital. Zinio got in touch with me recently offering ten free subscriptions to readers, with the option of keeping one for myself. So, I’m going to keep one for myself! Which means I’ve got nine to give away. To win, leave a comment with your real email address (which is not visible to anybody but me) on the following topic: what’s your most favourite magazine of all time, and why? Is it still around? Do you still read it? I’ll pick winners from what I think are the most interesting answers received in the next 7 days. Just try to keep it clean, okay? Update 26/7/2013 — You can keep the comments coming, but the competition is now closed. 2600. I have a life-time subscription. Not only is it still around after nearly thirty years, but has managed to do so without any paid advertising, surviving on nothing but retail sales, subscriptions, and the odd donation. Quite a feat, really. Variety – I used to visit McGills every week to scour the Broadway listings. Even air freighted it was always a few weeks old and far too expensive for a poor drama student to buy. I’m not even sure if it exists in paper form anymore – the online version recently became free but it is chaotically designed. Still, it’s lasted longer in the biz than I did. The newsagency is Acland Street, St Kilda closed down a couple of years ago (when I moved here twenty five years ago there were two in the street – about 250 metres apart). These days I’m kind of surprised when I visit another suburb and see one still in business. Byte – no longer published, but it was great mag for real geeks. It was expensive but worth it. Unfortunately I lost all my old copies in a house move. Interestingly in Moonee Ponds there is a newsagent in Puckle St that seems to be holding its own and also one in the Coles centre (about 500 m away), but that one survives on Tatts, and more recently a third has opened up in between these two. Not sure how the business is going as I haven’t used it. there is a recently opened NewsXpress newsagent in Southland near Aldi. PS My favourite magazine is Cosmos – it has readable scientific articles that are entertaining and not too nerdy. I like Silicon Chip most, I think. It’s been largely unchanged for years and I do read it when I get a chance, though I no longer have a subscription. Some of the projects in it are not particularly practical or useful, and some are just bizarre, but it has taught me a lot about electronics over the years and I still enjoy reading it and learning more. I also used to subscribe to Wheels until I realised that I had grown out of my adolescent obsession with acceleration and Australian-made cars, and had developed sufficient maturity to value safety over speed, but the publishers hadn’t. Now I only read it occasionally and there’s usually something in it to remind me of why I no longer buy it. That’s why Silicon Chip wins – it’s still relevant to my interests. I used to love reading Commodore Format, which was a Commodore 64 magazine. It is no longer around, as the format has died….however Retro Gamer does give me moments of nostalgia. I still re-read older issues, and have found some PDF’s online. 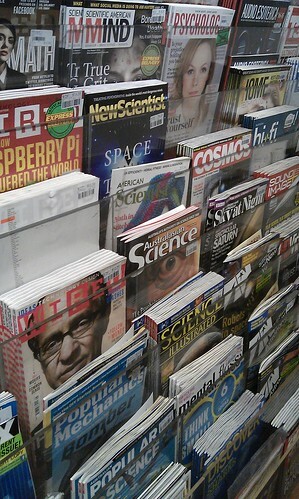 I still buy magazines, and subscribe to a few in print form…BRW and Scientific American among my list. When I was a kid I started reading Australian PC User magazine (now TechLife) when I saw a free copy of Monopoly on the included free CD. 15 years later and I’m working full time in the IT industry after being intrigued by the real content in the magazine and learning skills with each monthly edition. Australian Hi-Fi. The editor, Greg Borrowman, is still there and still witty. I have been reading it since I was about 10 years old, dreaming of the day when I would (firstly) begin earning money so that I could (secondly) buy all the dream AV equipment I yearned for after reading about it all. It’s strange to hear that newsagents are disappearing elsewhere – a new one has just gone in to my local shopping centre. Apparently, people in my area need two newsagents in the one handy location. My favourite magazine at the moment would have to be Australian Geographic because it is the perfect mix of stories. I always learn something new or fascinating or store away a previously unheard-of location to visit after reading each issue. I have a KoBo book reader, which does permit me to get magazine downloads. Only one issue, there are no magazines in m area. I prefer the good old paper variety anyway for some reason. I used to read dozens of magazines, stopped during an overseas trip in 2006, and never resumed. I bought a copy of The Economist to read on a flight in 2007, and that’s it, no more. I don’t know how the magazine publishers manage to stay in business. I really loved to get an American magazine called Crochet Today. My Gran had been an avid crochetter but as she lived across the country I didn’t get a lot of time to spend with her before she died. So when I first got the magazine I was inspired and it pretty much taught me how to crochet. But the subscription service is so focussed toward the american market that it was quite an effort to subscribe from Australia. I managed for a few years but then I just gave up. I haven’t really crochetted much since. My favourite magazine is Transit Australia. Good round up of what is happening with public transport around Australia and near neighbours. Growing up, it was definitely Dolly – Dolly Doctor taught me more about my body than health classes at school ever did. In a time before widespread Internet (I didn’t get Internet at home until I was 14), DD was a godsend.